Valencia CF biggest match in the Spanish league is almost here. Valencia CF has not won the Spanish league since the season 2003-04, while FC Barcelona has been dominating domestically and internationally the past few seasons with huge achievements such as winning 6 trophies in one season and braking all records in all competitions. Valencia CF gets 40 million TV rights money, Barcelona gets 140 million TV rights money. Valencia champions league qualification is considered a success, while for Barca winning only La Liga is somewhat of a dissapointment. The contrast between these two clubs is huge, especially in recent years, but when these two sides meet on the grass what matters is only the performance on the pitch and nothing else. Valencia CF is currently on an unbeaten streak from December 5th and last time it lost was against R. Madrid in the Spanish League. Clearly there is bonus motivation in this match in order to keep that unbeaten streak and at least get a draw, but why not even surprise us all and beat Barcelona. The first match between these two teams played at the Camp Nou ended in a narrow 2-1 victory for Barcelona. You can check the match report for that game here. Valencia CF is going into this match with the intention of continuing its unbeaten run and apart from a loss it will be good enough to get even a draw and not to mention a surprise win, that would be huge. Chori and Miguel are still suspended by the coach and its doubtful if they will get called to the squad, Bruno and Topal will miss the match due to 5 yellow cards each and David Albelda is still injured. Defense: Navarro, Delabert, Ricardo Costa, Stankevicius, Jordi Alba, Mathieu, Maduro, Montoro. Midfield: Tino Costa, Ever, Joaquín, Pablo, Vicente, Mata. *Maduro was injured during the last training before the match and Montoro took his place. FC Barcelona on the other hand are coming in this match as the hot favorites to win and get the three points, but the Mestalla has been a tough venue for them in recent years, Barcelona are in a bit of match fatigue right now as several of their players have played for over 90% of the matches for the team, players such as Iniesta, Messi, Busquets and Villa. David Villa may miss the match as he has some personal business to attend to, Victor Valdez is also missing and Pinto will once again be on the goal, Xavi has been training and regaining fitness, so he may be fit to play after all even though he was injured and thought to be missing for 2 weeks. Defense: Dani Alves, Piqué, Gabi Milito, Maxwell, Adriano, Abida. Midfield: Xavi, Iniesta, Mascherano, Keita, Busquets, Afella. Attack: David Villa, Bojan, Messi, Pedro. Valencia winger Joaquin has suggested that his side cannot afford to lose to Barcelona when they host the Spanish champions at the Mestalla in a Spanish Primera Division encounter on Wednesday. It is three points we can't afford to let slip from our grasp," said the 29-year-old, according to AFP. "We will suffer a lot because they are a great team but we are going to try to impose our style of football. "If we can make them feel uncomfortable we have a great chance of winning." "If Barcelona keep possesion as usual, then we are cannon fodder," Emery said ahead of tomorrow's battle at the Mestalla. "It will be important to see our personality and the state of the pitch. We know Barcelona will create chances, but we have to avoid goals. "We must also try to get close to their goal. We have to maintain the ball and we know we can do this. "They are the best team in the world with the best players in the world and have one of the best coaches in the world." "I don’t want to leave a bad taste in people’s mouths, so I won’t celebrate if I do score a goal." "It will be a weird sensation, for example, going to the dressing rooms”and having to go to the visitors and not the home one." Line up: Guaita; ?, Navarro, R. Costa, Dealbert, Mathieu; Maduro, Banega; Joaquin, Soldado, Pablo. Tactics: High attacking frequency by the full backs, low defensive line and own half opposing team pressure, deep zone defensive midfielders, wing attacks, mixed passing with mixed crossing. 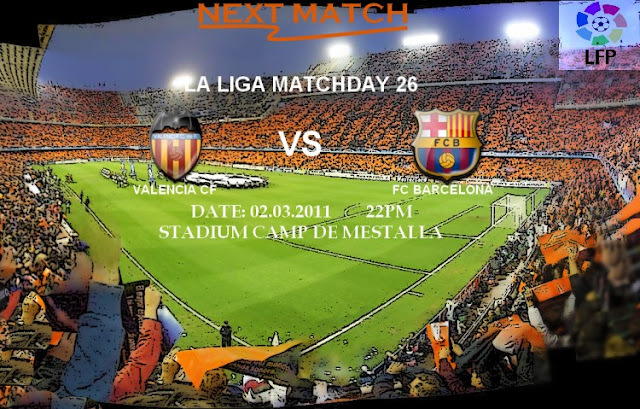 In order to win or even draw against Barcelona, Valencia must beat them at their own game. This means Valencia can't sit back and defend and with VCF defenders conceding a goal is certain, so Valencia must have big possession and pressure Barcelona constantly when they have the ball.